Noting the importance of targeting the right places, Dobyns said his general game plan involves seeking outside cover heading into the spawning pockets. Specifically, he likes ledges, points, and any hard structure the fish can use for staging before advancing into the shallow zone. That light breeze, Dobyns said, breaks up the surface, mutes light penetration and decreases the fish’s visibility. With the bass less wary and more apt to make a mistake, Dobyns puts a trio of Yamamoto baits into action. Lauded as one of the most user-friend baits ever invented, this ultra-limber worm with tapered ends and a salty constitution is Dobyns’ go-to choice for several spring scenarios. For maximum efficiency, Dobyns uses one of two rigging options, depending on where he’s targeting prespawners. Regardless of rigging style, Dobyns says the Senko’s appeal is simple — that junk in the trunk. “The action of that Senko with that little wag in the tail, it’s just a great prespawn bait,” he said. “When you nail weight it with a O-ring, the bait actually stands up in the water very, very well. That’s just an action that makes the fish want to eat it. The reason this action proves so important during the spring is that it’s always fishing for you. As Dobyns points out, anglers fishing deeper spots won’t always detect bedding fish. For his spring work, Dobyns often uses the baby bass and natural shad colors; but it the water has a little tint, his all-time favorite is watermelon/green pumpkin laminate. In more off-colored water, he goes with black or green pumpkin. As for prespawn targets, Dobyns likes skipping his weightless Senko under floating docks for fish holding near the surface and warming their backs. He’ll also throw it in sparse grass or holes in dense grass, along dock pilings and next to standing timber. “The wacky-rig is a slow presentation that you have to fish on slack line so the bait has a straight vertical fall and they just can’t stand it,” Dobyns said. “Once that bait hits the bottom, I may shake it once or twice and then wind it in and make another cast. I do not ‘work’ a weightless bait. Tackle: Dobyns Champion 735C baitcaster when fishing 12-pound line or heavier in giant factories like Lake Fork, the Cal Delta or Clear Lake. When open water allows him to get away with 8-pound line, he’ll go with a Dobyns Champion 733 SS spinning outfit. This one’s kinda sentimental, as it was one of the baits Dobyns fished during his 2009 U.S. Open win. Even beyond this convincing experience, he says the flamboyant plastic has been a consistent prespawn producer — especially when rigged on a 1/4- to 1-ounce football head. 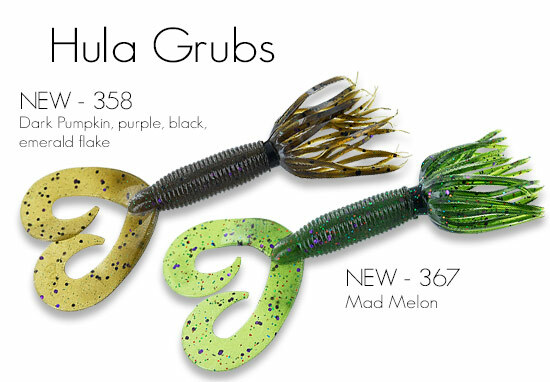 With green pumpkin, cinnamon purple flake and watermelon black flake his top colors, Dobyns said he’s usually fishing this bait with a bottom presentation, but he has also caught a lot of fish while swimming his Hula Grub back to the boat. “I let it fall on taught line, so it’s swimming all the way down and then work it across the bottom,” Dobyns said. “I’ll also swim it across points, like a crankbait. The difference is that, unlike a crankbait, you can control the depth by varying the football head size. Tackle: Dobyns does most of his Hula Grub work with a Champion 704 or 744. The latter’s his choice for deeper water, as the extra fast action affords him better hook sets. Viewing this 5-inch bait as a predecessor to the modern swimbait craze, Dobyns fishes the hefty grub on either a light ball head or a darter head. This is mainly a light line, open water Western technique, so the open hook rigging style works just fine. Fishing a Super Grub on nothing heavier than 8-pound line, Dobyns uses only spinning tackle for this technique. Smoke Pepper and Baby Bass are is favorite colors and Dobyns notes that this bait, too, has a special place in his heart.